Israel has accepted an Egyptian truce proposal for the conflict with Gaza. 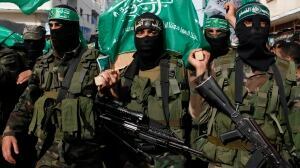 Hamas, which controls Gaza, is still discussing the plan, but its armed wing has rejected it as a "surrender". There have been no Israeli air strikes into Gaza since the 09:00 ( 06:00 GMT) truce, but Israel says 39 rockets have been fired from Gaza into Israel after the deadline. US Secretary of State John Kerry said he could not "condemn strongly enough" Hamas' actions in continuing to fire rockets despite the ceasefire call. An Egypt-backed cease-fire between Israel and Hamas fell apart Tuesday as rocket attacks from Gaza were again answered by Israeli airstrikes. The rocket attacks from Hamas militants in Gaza never ceased, Israeli officials said. For its part, Israel refrained from airstrikes for about six hours before announcing it was resuming them. A CNN crew witnessed at least five Israeli strikes just as the announcement was made. Israel Defense Forces said 47 rockets were fired into Israel during the cease-fire period, which Hamas never accepted.